It has been two years now since the passing of my dear Bicky. It's amazing how fast time passes . When I lost him, I couldn't imagine being able to get through a single day without him by my side...but here I am. Actually, I find myself in the same place I did a year ago (on his 1st year anniversary) ..managing through life, but still grieving. Most of my friends and family members show little understanding as I navigate this grief process for "just a dog". It is therefore not an understatement to say that this board has been a Godsend. I really don't know how I would have been able to get through all this without the love and support of the. people on this board. Thank you so much. Below is a piece I wrote in honor of Bicky's first year anniversary. I thought it fitting to repost it in honor of Bicky's second anniversary. Again, thank you all for your support. 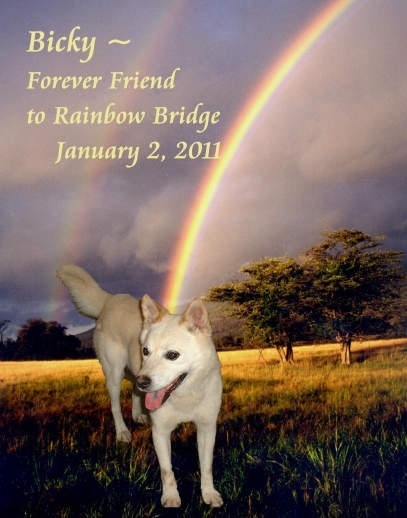 January 2nd , 2012 will mark the 2nd year anniversary my beautiful baby boy (my pet dog, Bicky) made his way to the Rainbow Bridge. As some of you know, my girlfriend (Naoko) and I found Bicky as a stray on the streets of Tokyo in 2002, and we were blessed with nine wonderful years with him. One year on, I am still mourning his loss greatly. Especially around the holidays, I feel the emptiness and the sense of loss is amplified. I have some weeks that are better than others, but I’ve found that the waves of grief can sneak up and overwhelm me. I am guessing that this pain and sorrow will never completely dissipate with time, and the quiet grief and loneliness I experience at times is just the new normal for me. His death has made me a better person though, helping me understand the value of friendship, love, and how precious (and fleeting) life can indeed be. I keep his urn in a prominent place in my house, along with a digital photo frame with over 500 rotating pictures of him. This has brought Naoko and I much needed comfort. For those interested, Bicky died beautifully. Leading up to his passing, he had been quite ill for 4 or 5 months. The veterinarian determined that he had Cushing’s disease, but was somewhat optimistic that some new (revolutionary) medicine could help his condition. Bicky slowly deteriorated though. I was in complete denial and convinced myself that he would miraculously rebound and put it all behind us. But it was not to be. Bicky’s last Christmas was tranquil and joyful. We spent it up in the mountains (at Naoko’s parents’ house) in Northern Japan. Although he had trouble walking, we made a beautiful bed for him right beside the Christmas tree. He was surrounded by everybody he loved and he was even able to eat a little turkey and enjoy the Christmas ambience. He seemed so happy and content. His condition took a turn for the worst though on New Years’ day, so Naoko and I decided to drive Bicky to a veterinarian hospital in Tokyo. The doctor was a bit taken aback by Bicky’s deteriorating condition. He hydrated him with an IV, and instructed us to bring him back the next day. That night we lay Bicky down in his bed, located in the same living room we spent so many wonderful times together. For the previous 4 months, I had slept on the living room sofa, so I could be with Bicky during the evening in case he needed me. His bed was right beside mine. Bicky looked much better. I remember I crawled up beside him, and whispered, “We have a big day tomorrow Mr. Handsome; we have to wake up at 8am to go to the vet’s”. Bicky licked my nose and then rested his head on his (favorite) soft green pillow. I put a light blanket on him, kissed him one more time, and turned off the light. I kept a flashlight beside me, so I could sometimes see how he was doing during the evening. I turned the flashlight on once as if to say “hello”, and Bicky wagged his tail as if to say “I’m o.k. Now try to get some sleep Mark”. I did just that. I slept like a rock that night, and the sun was already up by the time I awoke. I turned over to say “good morning” to my Bicky…but as soon as I laid my eyes on him, I realized that he chose that night to let go. Thank you again everybody for your (continued) support. And thank you Bicky for being my best friend (ever). I had marked Bicky's anniversary on my outlook calendar 2 Jan. I always wonder if there is more to life than life that we are seeing/living. Coming on to this forum, and reading to everybody's cry's from the soul I understand there is a language which only our heart understands and "our" forum helps us to understand that. Thanks. I don't see how anyone could say he's "just a dog", a dog is one of the most wonderful creatures to bless our life! To me they should be elevated, not the other way around. I call my Arlie my "little boy" which people think is funny because he's so big, but it's not the size but the familial position I'm referring to when I say it. To me he is very much like a little boy of my own. I love the picture you posted, that is beautiful, and I totally understand your grief. I hope it gets easier for you. When my husband passed, it took me a good three years to process and adjust to it, but the missing him never goes away. It's so comforting to know there are people that understand my grief such as you two. I believe dogs (and animals in general) are worthy of as much (or more) love, respect, and trust than humans. I pity those who have never experienced the beauty of a relationship with these Earthly angels. Love transcends species. Such a difference is a technicality (I believe) in God's eyes. I know that some out there would consider this blasphemy, but I just know it to be true in my heart of hearts. It was very therapeutic to read your letter tonight. I usually do end up signing on to this site late at night when I am alone with my thoughts on how much I miss my best friend. I am betting your letter reflects a majority of people who come to this site for comfort. It never does get easier no matter what anyone says. You are right in that it probably will never go away but then how could it when your best friend leaves you. It is coming up on the 2nd anniversary of my loss and not a day goes by that I do not think of her. I recently had a dream of her laying on my husband's lap and I was petting her and how peaceful I felt. I woke up feeling so good because it was like she was was there again. Anyway, thank you for your letters because they really do help. I, like yourself, usually come on this website late ate at night (early in the morning). This is when my mind and heart start to think of Bicky and the loneliness starts to creep in. This website is such a nice refuge to retreat to when I am in need of understanding and comfort. I don't know how I would have been able to navigate my grief without the comfort of others who understand my pain and loneliness. . I believe that our fur babies go to heaven and we will eventually be joined with them. I also, like yourself, sometimes have had dreams of Bicky. I like to believe that this is Bicky's way of making contact with me (holding me over) until I eventually "earn my wings"and we are together again. I wish you love and strength as you embark on the year 2013. It is true that we never truly stop missing them...I wish I could have each of my pets back for a time, I miss them all in different ways and to different degrees. Even though I've had pets all my life, I am my closest to Arlie and I don't know how my life will have any meaning once he is gone...I know the day will come but I try not to think about it too closely. I try to just enjoy each and every day as it comes and when the time does come that I lose him, I will have to content myself with knowing we lived our relationship to the fullest and enjoyed each moment together, and my memories will have to sustain me until we can be together again. Mark, I love how you said "earn my wings!" I couldn't have put it better. I try very hard not to be discouraged by those who do not believe our pets will be in Heaven. I have faith that God knowing the hearts of those who love their pets, will indeed reunite us with our furry friends. I hope that you will continue to write about Bicky. My mom has always been one of those that touts pets not having souls, not going to heaven, etc. I consider the source. The Bible talks about there being animals in heaven, and knowing God as I do, He doesn't strike me as the sort that would waste perfectly good animals in favor of just creating new ones. I also figure, if a lion and a lamb make it there, why not my dogs and cats? He knows how we feel and how important they are to us, He is the one who entrusted them to our care! I don't worry about it...I figure dogs will make it in easier than people will. I have already written a few more chapters, but I am just letting them settle for a while before I post them.. I don't think I'll ever stop writing about the Bixter. @marklovesbicky I loved reading about Bicky, I don't see the stories here anymore, have you deleted them? Did you ever write a book? Hi Mark you sound like you gave Bicky the utmost care and love, how lucky was he. I felt all your sadness reading your write up gosh the pain is so heart breaking. 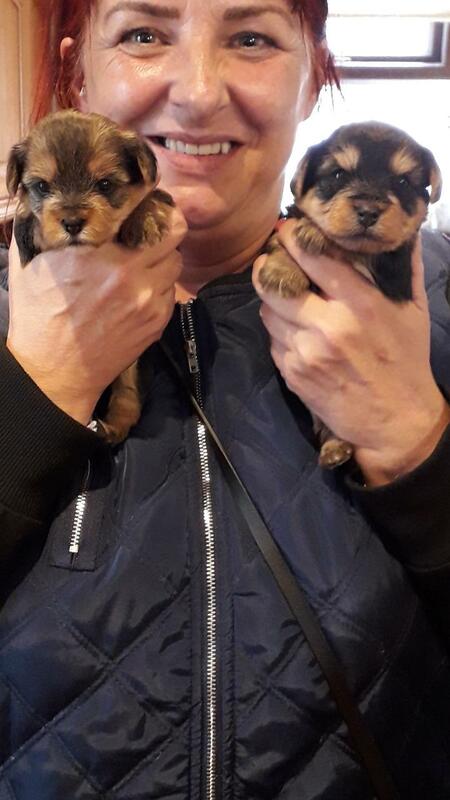 Sharon, thank you for this uplifting and sweet picture of your new babies. My family’s special baby passed on Friday. It’s hard for me to think about replacing her because the grief is so raw right now and it’s just not possible to find another cat friend like her. She was always there for us, laying on my husbands chest with her face up on his chin. She lived him dearly and they were the best buddies and bonded more than anyone s else in the family. He was quiet for two days and broke down last night. I know it’s going to happen many more times and we’ll never stop wishing she was here and missing her every single day. Thank you for posting your happy smile with a Bubbles and Squeek as it gives hope to me that we will be able to go on and even maybe add another baby that will also become a best friend to our family like Snooki was to us for so many years. Oh it took alot of talking to myself to get these .. I live on my own so I miss the company.. i spend alot of time at home being disabled too My Beau gave me everything and more, he was my soulmate. I know getting another has to feel right .. i also know the twins will be different.. there is only going to be one BEAU.. My family were becoming increasingly worried about my sadness but I know my boy wouldn't want me to be sad.. I wish you luck and love ..
Beautiful little bundles of joy! I wish you many years of delight and joy with them!